After setting up enrollment agreements, you can start using Populi to generate agreements and collect them from your students. Only the student can sign his own agreement! No other user is permitted to sign the agreement on behalf of the student. If you're using one of the required agreement options, your students will need active user accounts in order to digitally sign them. Your students must have an academic program and a default tuition schedule. When a student has an enrollment agreement, here's what it looks like on his profile. Agreements appear on Profile > Financial. If you're using a Per student... option, it will appear on the Dashboard view. If you're using a Per term... option, it will appear on the By Term view. The Signed/Unsigned pill indicates whether the student has signed the agreement. For the required... options, unsigned agreements will affect what happens with a student's registration. Click the date to see the agreement. 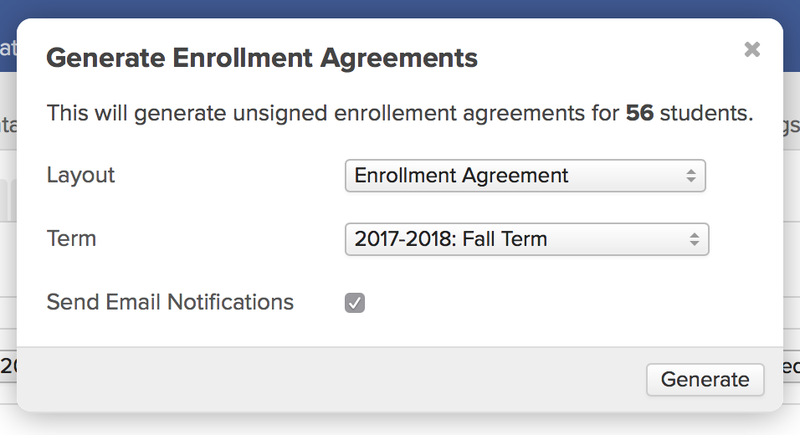 Depending on your selection in Financial > Settings for the Enrollment Agreements setting, you'll have a few different options for generating unsigned agreements for your students. This workflow works with any of the enrollment agreement administration methods in Financial > Settings. You can generate agreements for groups of students in the Data Slicer; if you're using any of the Per Term... options, you can also generate them in Billing > By Term > Summary. Go to either reporting view and run a report. 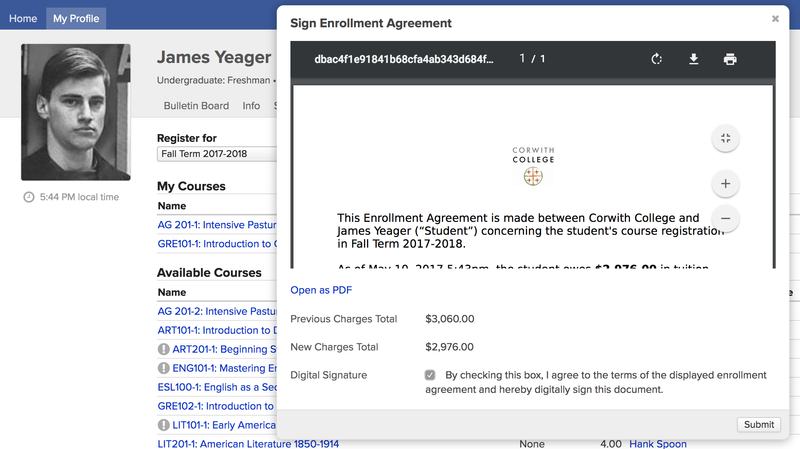 Click Actions and select Generate Enrollment Agreements. If using a Per term... method, you'll have to select a term in the Data Slicer's dialog. In Billing, the agreements will be generated for the term shown in the report's term selector. Check if you wish to email notifications to the students. The notification includes a link to where they can digitally sign their agreements. When you're ready, click Generate. This process generates unsigned agreements only for students shown in the report who do not already have an agreement in place. It is now up to those students to sign those agreements. If you generate an agreement for a student in error, go to his Profile > Financial view and click next to the agreement. Generate an agreement for an individual student on his Profile > Financial view. If you're using a Per Student... option, you'll do this on the Dashboard view; if using a Per Term... option, you'll do this on the By Term view. Go to his Profile > Financial view and select Dashboard or By Term. Check if you wish to email the student a notification. The notification includes a link to where he can digitally sign his agreement. This process generates an unsigned agreement for the student. It's now up to him to sign the agreement. This workflow works with any of the required administration methods. An Academic Admin sets up an online enrollment period for an upcoming academic term. If you are using a delay or lottery option for registration, the timeframe you establish for that will determine when the agreements are generated. If using a Per Student option, Populi checks to see if he has already signed an agreement. If he has, then no new agreement is generated. If he has not (or if the previous one has been deleted), then Populi generates a new agreement. If using a Per Term option, Populi checks for changes in the student's enrollment or amount owed and generates an agreement as appropriate. The student is prompted to sign the agreement. If registration is processed immediately, then he can sign it right on the Registration view. If registration is processed later, or if he navigates away before the agreement is generated, Populi will email him a link to sign the agreement. All of the student's registrations are kept in pending status until he signs the agreement. If the student does not sign the agreement within 24 hours of its generation, his registrations will expire and he will need to re-register. The student signs the agreement digitally by checking a box that indicates his understanding and consent. If an advisor, registrar, or academic admin registers a student, Populi will email him a link to sign the agreement. When enabling enrollment agreements in Financial > Settings, use one of the not required settings. To store one agreement on Profile > Financial > Dashboard, choose Per student, not required. To store agreements on Profile > Financial > By Term, choose Per term, not required. When you have a file of the student's agreement, go to her Profile > Financial view and select Dashboard or By Term (depending on your selection for Step 1). Indicate whether it was signed and, optionally, what amount was agreed to. On Profile > Financial > Dashboard or > By Term, you can find the student's agreement(s), both signed and unsigned. In Billing > By Term > Summary, you'll find a filter condition/report column for Enrollment Agreement, which indicates whether the student's agreement is signed or not. In Academics > Reporting > Data Slicer, in the Financial portion of the filter drop-downs, you'll find conditions for enrollment agreements.